View More In Permanent Magnet Motors. This Economy Gearmotors are reliable and affordable for a wide array of project applications Operating Specifications: Operating Voltage Range: 6~18VDC Rated Voltage: 12VDC Operating Temperature: -10 ~ +60°C Max No-Load Current: 0.10A No-Load Speed: 124 RPM Min. Stall Torque: 30.20 kgf-cm (419.45 oz-in) Max. Stall Current: 3.8A @ 12VDC Output Power at Max. Efficiency: 4.27W Gear Type: Spur Gear Ratio: 78:1 Shaft size: 4mm (0.1575") Net Weight: 0.20lb (3.25oz) Mounting Screw Size: 3mm Please Note: Stall Torque is the torque which is produced by a motor when the output rotational speed is zero, it may also mean the torque load that causes the output rotational speed of a motor to become zero - ie to cause stalling. Electric motors continue to provide torque when stalled. However, electric motors left in a stalled condition are prone to overheating and possible damage since the current flowing is maximum under these conditions. 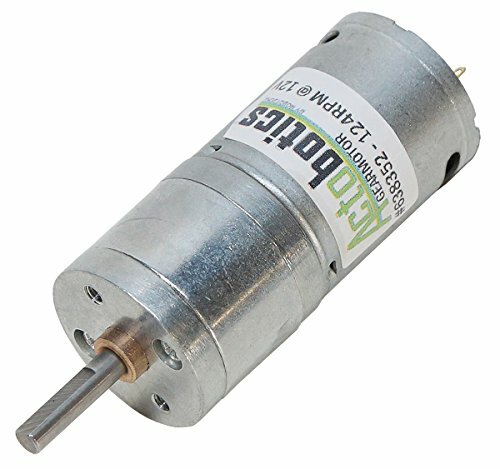 We offer several 4mm bore gears that work with this motor. The Digital Manual Speed Controller provides proportional forward and reverse control of your gearmotor. If you have any questions about this product by Actobotics, contact us by completing and submitting the form below. If you are looking for a specif part number, please include it with your message.